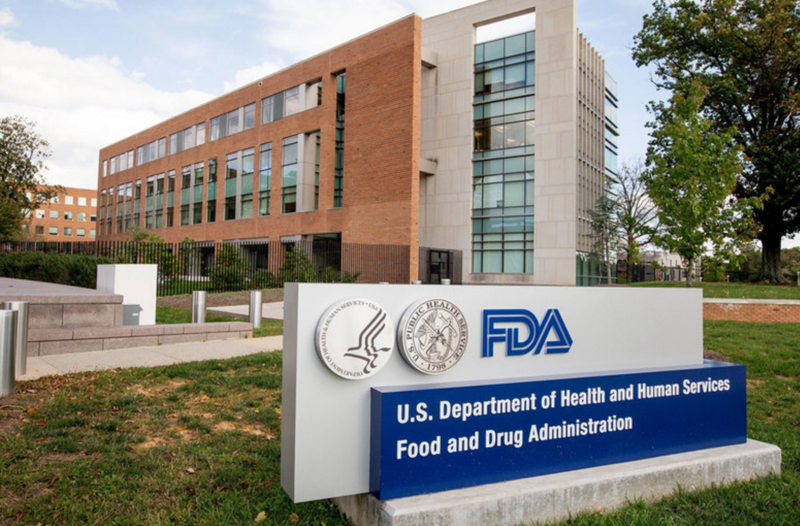 FDA is holding a public hearing on Manufacturer Communications Regarding Unapproved Uses of Approved or Cleared Medical Products. 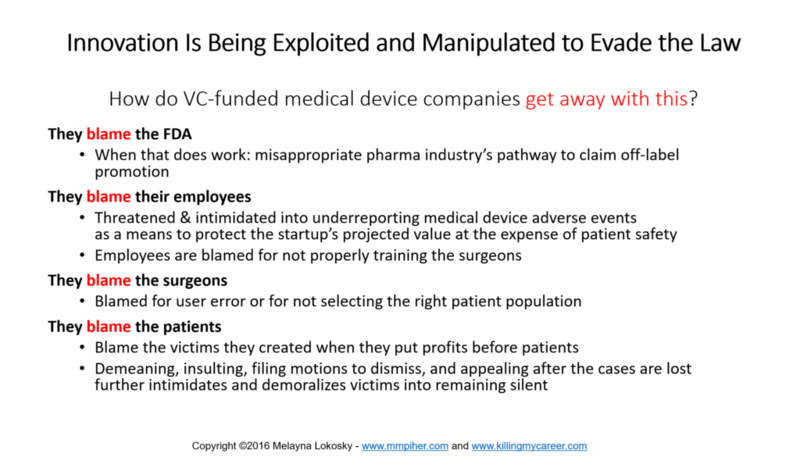 Not surprising, but certainly insulting, the first speakers are paid shills for the pharmaceutical and medical device industry, falsely designed to look like patient advocacy groups. 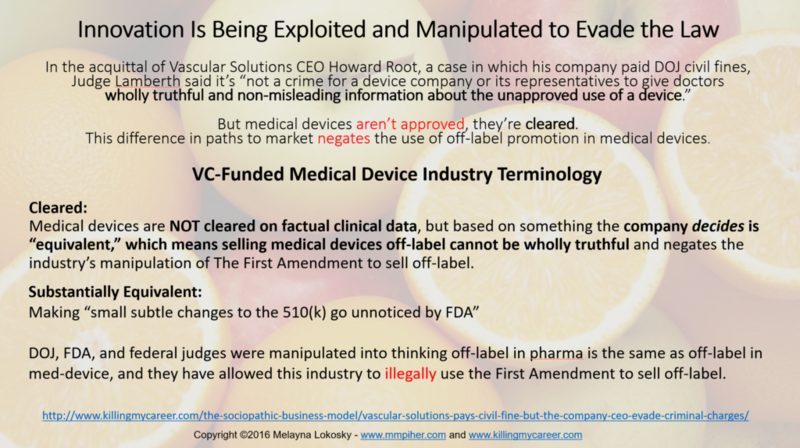 As, I’ve often said the industry is using innovation as a manipulation to evade the law and these shills hiding behind the red flag buzz words: First Amendment, value-based, real-world, Safe Harbor, wholly truthful & non-misleading information, standard of care, all for one purpose: they payors not the patients. 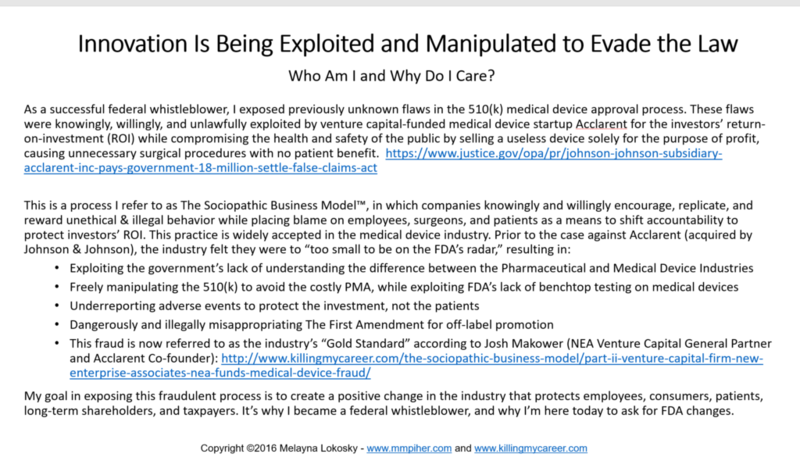 The industry putting profits before patients is WHY there’s even a need for this meeting and it’s demeaning and insulting that these people who represent the industry are allowed to manipulate a public hearing for the industry that has harmed so many needlessly. Here’s just a sample: Michael Labson of Covington & Burling LLP, whose law firm represented three of the companies that paid the highest DOJ billion dollar fines for Pfizer, Glaxso Smith-Klein,and my personal favorite Johnson & Johnson, thinks that clinically sound data, determined anecdotally not scientifically, should allowed for sales reps to discuss in order to get payors reimbursement information. That sounds a lot like ignoring the law to put profits before patients, oh wait, because that’s exactly what it is. This shill is brought to you by PhRMA or Pharmacutical Research and Manufacturers of America. 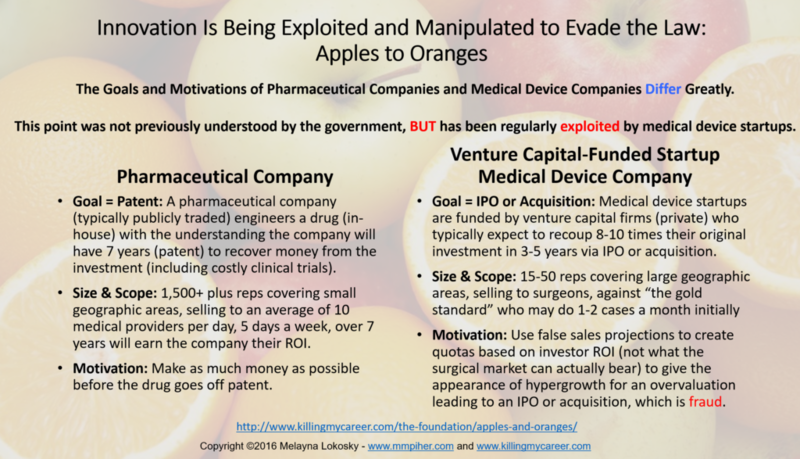 Not to be out done is E. Cartier Esham (Biotechnology Innovation Organization BIO)) wants to wait for it…share truthful and non-misleading information with payors for reimbursement. Except truthful in proven by scientific data which is inconsistent & contradictory to what she’s suggesting. 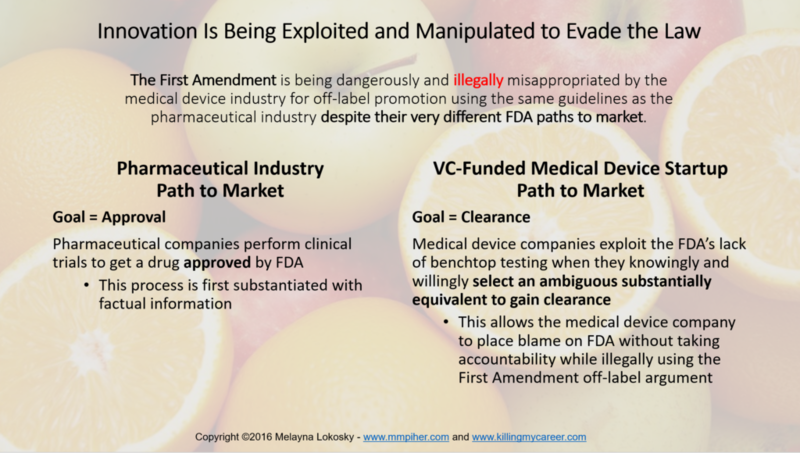 The industry doesn’t want to do expensive additional testing and is just looking to exploit a loophole in the law. 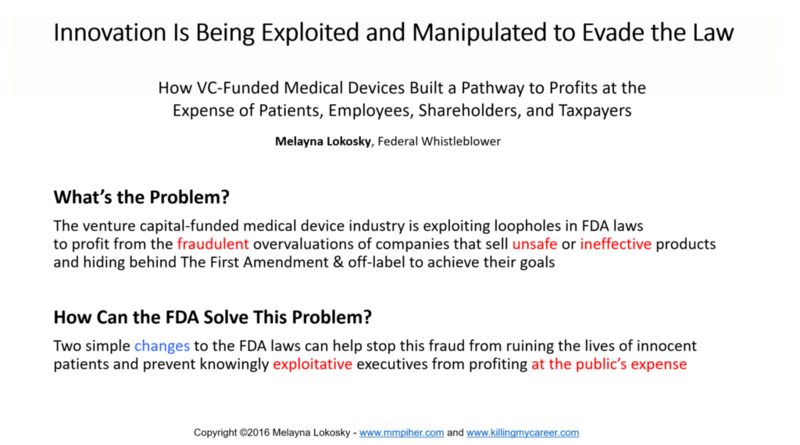 And my personal favorite thus far this morning was, Khatereh Calleja of AdvaMed who stated she cannot imagine a medical device company would sell a device that wasn’t necessary (ahahahahahaha) and that real-world evidence (non-scientific) should be essentially viewed as truth from the companies to FDA. Ohhh, Khatereh let me enlighten you as to why I’m here in this room that now needs forensic cleaning to get the unethical stain from the first speakers removed. Medical device startup Acclarent sold a wholly useless device to the tune of $40 million and was fined by DOJ $18 million, and how do I know? I was the whistleblower in the case. White collar crime attorneys, and the room was full of many of them today, were panicked Clinton lost because the industry funneled $41 million into her Super PAC run by none other than Covington (yep that Covington). I overhead one attorney saying they were having an emergency meeting and the White House wants everything done by January 20, 2017. 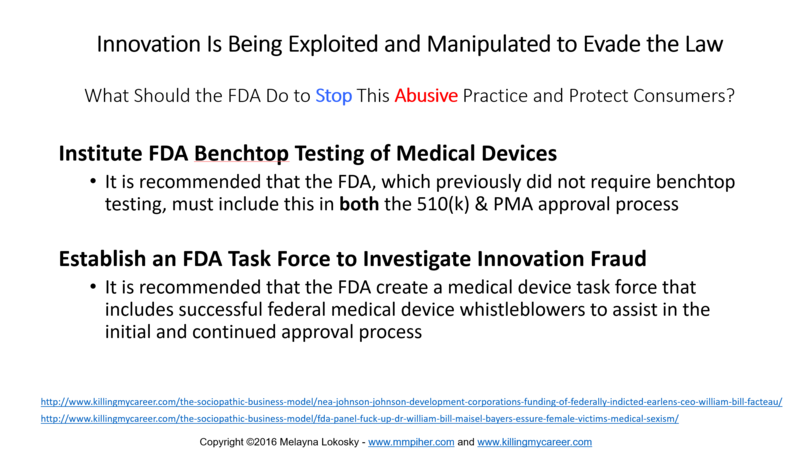 Look for lots of medical device and pharma fraud eeking through at the 11th hour, where the company pays a fine and no one does any time. Greed loop whole war on women! 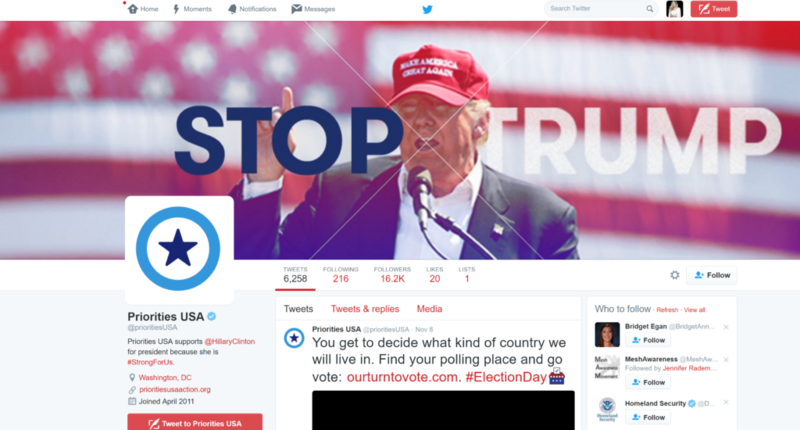 Off-label communications will happen. Get over it. It will happen and executives will start to go to jail. Let’s begin with the arrested, indicted & convicted William (Bill) Facteau & Patrick (Pat) Fabian by sentencing them to jail on January 11, 2017. The industry cannot continue to cause harm without accountability.